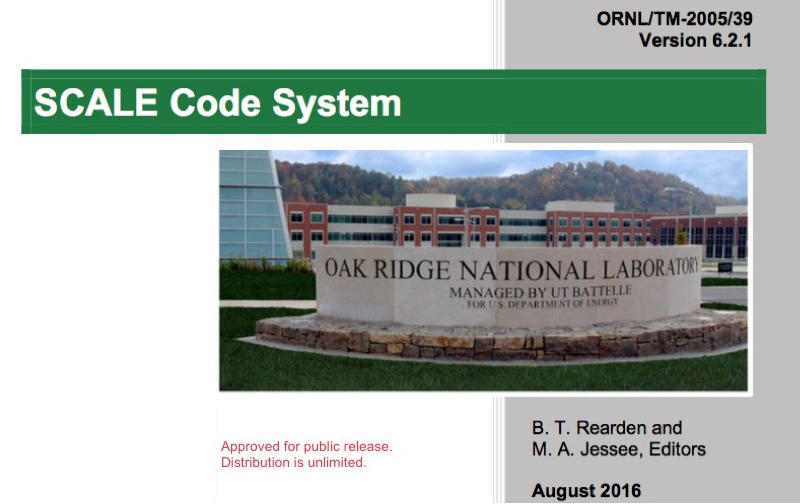 B. T. Rearden and M. A. Jessee, Eds., SCALE Code System, ORNL/TM-2005/39, Version 6.2.3, Oak Ridge National Laboratory , Oak Ridge, Tennessee (2018). Available from Radiation Safety Information Computational Center as CCC-834. D. Wiarda, M. E. Dunn, N. M. Greene, C. Celik, and L. M. Petrie, AMPX-6: A Modular Code System for Processing ENDF/B, ORNL/TM-2016/43, Oak Ridge National Laboratory, Oak Ridge, Tennessee (2016). Available from Radiation Safety Information Computational Center as CCC-834. M. A. Jessee, POLARIS Overview, Tutorial Presentation, Oak Ridge National Laboratory, August 2018. R. A. Lefebvre, Fulcrum User Interface, Tutorial Presentation, Oak Ridge National Laboratory, October 2016. W. A. Wieselquist, A. B. Thompson, J. L. Peterson, and S. M. Bowman, ORIGAMI Automator Primer: Automated ORIGEN Source Terms and Spent Fuel Storage Pool Analysis, ORNL/TM-2015/409, Oak Ridge National Laboratory, April 2016. B. J. Ade, SCALE/TRITON Primer: A Primer for Light Water Reactor Lattice Physics Calculations, NUREG/CR-7041 (ORNL/TM-2011/21), prepared for the U.S. Nuclear Regulatory Commission by Oak Ridge National Laboratory, Oak Ridge, Tennessee, November 2012. S. M. Bowman and I. C. Gauld, OrigenARP Primer: How to Perform Isotopic Depletion and Decay Calculations with SCALE/ORIGEN, ORNL/TM-2010/43, Oak Ridge National Laboratory, Oak Ridge, Tennessee, April 2010. B. T. Rearden, D. E. Mueller, S. M. Bowman, R. D. Busch, and S. J. Emerson, TSUNAMI Primer: A Primer for Sensitivity/Uncertainty Calculations with SCALE, ORNL/TM-2009/027, Oak Ridge National Laboratory, Oak Ridge, Tennessee, January 2009. S. M. Bowman, KENO-VI Primer: A Primer for Criticality Calculations with SCALE/KENO-VI Using GeeWiz, ORNL/TM-2008/069, Oak Ridge National Laboratory, Oak Ridge, Tennessee, September 2008. R. D. Busch and S. M. Bowman, KENO V.a Primer: A Primer for Criticality Calculations with SCALE/KENO V.a Using GeeWiz, ORNL/TM-2005/135, Oak Ridge National Laboratory, Oak Ridge, Tennessee, December 2005.